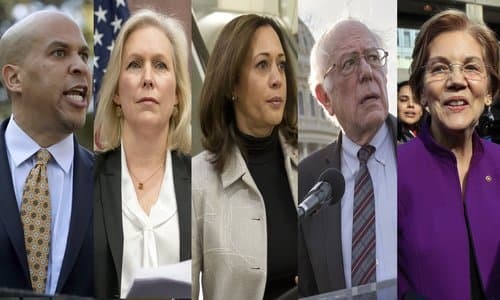 As reported on the National Review, "All six of the Democratic senators currently running for the 2020 presidential nomination voted against the bill: Cory Booker (N.J.), Sherrod Brown (Ohio), Kirsten Gillibrand (N.Y.), Kamala Harris (Calif.), Amy Klobuchar (Minn.), and Elizabeth Warren (Mass. ), along with Independent Bernie Sanders of Vermont." But none of this is surprising at all. When the god of abortion is threatened by affirming the sanctity of a baby's life, inside or outside the womb, the Democrats will opt for death. "(B) following the exercise of skill, care, and diligence required under subparagraph (A), ensure that the child born alive is immediately transported and admitted to a hospital. "(2) MANDATORY REPORTING OF VIOLATIONS.--A health care practitioner or any employee of a hospital, a physician's office, or an abortion clinic who has knowledge of a failure to comply with the requirements of paragraph (1) shall immediately report the failure to an appropriate State or Federal law enforcement agency, or to both. "(1) IN GENERAL.--Whoever violates subsection (a) shall be fined under this title, imprisoned for not more than 5 years, or both. "(2) INTENTIONAL KILLING OF CHILD BORN ALIVE.--Whoever intentionally performs or attempts to perform an overt act that kills a child born alive described under subsection (a), shall be punished as under section 1111 of this title for intentionally killing or attempting to kill a human being." Should a baby survive an abortion, the health care practitioner shall "exercise the same degree of professional skill, care, and diligence to preserve the life and health of the child as a reasonably diligent and conscientious health care practitioner would render to any other child born alive at the same gestational age." As Senate majority leader Mitch McConnell stated plainly before the vote was taken, "It isn't about restrictions on abortion. It isn't about changing the options available to women. It's just about recognizing that a newborn baby is a newborn baby, period." And he asked, "Can the extreme far-left politics surrounding abortion really have come this far?" Are we really supposed to think that it's normal that there are now two sides debating whether a newborn, whether newborn living babies deserve medical attention?" According to Senate minority leader Chuck Schumer, the bill "is carefully crafted to target, intimidate, and shut down reproductive health care providers." That is utter nonsense (and note that Schumer was careful to speak of "reproductive health care providers" rather than refer to abortion providers). He claimed that the bill "would impose requirements on what type of care doctors must provide in certain circumstances, even if that care is ineffective, contradictory to medical evidence, and against the family's wishes." Nonsense again, unless, of course, it's up to the family to decide whether their newborn baby should live. Or whether "medical evidence" would mandate letting the baby die without care.